Kim Bentley and Sally Spens both studied at Goldsmiths’ College, on the textiles/fine art course, before working in the applied art of textile design. Engaging with fashion and interiors, and designing both printed and painted textiles, their work has been featured in magazines worldwide, including World of Interiors, House & Garden, The Face, ID, Tokyo Calender, Marieclaire Japan, British and American Vogue. In the eighties their hand painted men’s shirts were sold by Paul Smith and New York stores Bergdorf Goodman, Henri Bendal, and Saks Fifth Avenue. Collaborations with interior designers led to collections of hand printed fabrics, which were specified in projects in the UK, USA, France, Japan, New Zealand and Germany. Liberty of London retailed the range and in 1992 also displayed Bentley & Spens’ painted textiles in the atrium of the store. The connection with Japan began in 1992 when Bentley & Spens were invited by Yoichi Nakamuta of the E&Y Co. to join other designers in the interior design field eg. furniture, lighting etc. as collaborative artists. 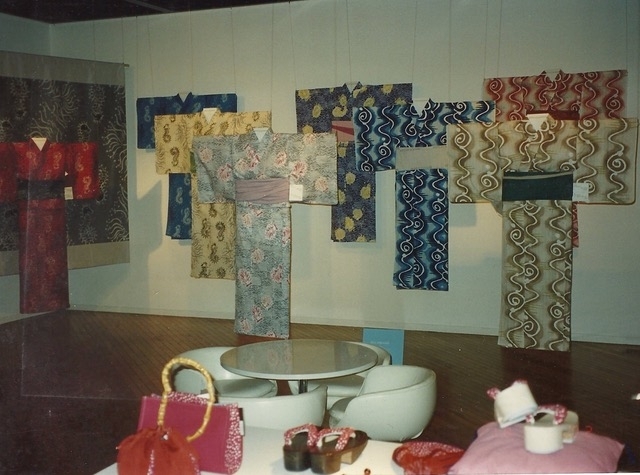 Exhibitions at E&Y Co., Tokyo and Spazio di Naoki, Toyama City (1998) showed painted works and printed textiles. British Textiles – 1700 to the present. 1995 The European Art of Textiles : British and Continental Textiles from the 11th Century to the 1990’s. Touring exhibition in Japan. Bentley & Spens still work together on specific projects, most recently the Shared Histories exhibition.